According to Finance Act 2014, the federal government has amended SRO 575 2006-07 and imposed a tax of 32.5% on import of Solar Panels. It must be noted that Solar Panels were placed in a special category with no tax since 2006. This was done to encourage the adoption of this Alternate Energy in the country. The government instead of taking steps to promote Solar Energy has taken the worst possible decision, at a time when the country is facing an acute energy crisis. The only possible explanation for this action is that the government intends to encourage local production of Solar Panels, which at the moment is minimal. What is troubling is that the Alternate Energy Development Board (AEDB) which is tasked with increasing the Alternate Energy contribution in the country to about 5% by 2030 was not even consulted. The breakdown of the imposed tax is as follows. Hardest hit are the importers who had imported Solar Panels in bulk and now have to pay taxes amounting in millions of rupees (5-6 million per container). According to sources there are about 60 to 70 containers at the port which are waiting for clearance by customs. 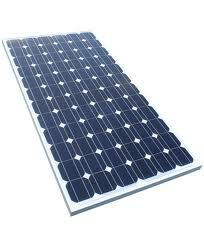 Also suffering are Solar solution providers who do not have enough equipment now to fulfill their commitments. It must be noted that energy demand reaches its peak in summer months and this is the time when Solar businesses make their profits. Also to be hit is the agriculture sector where Solar Pumps have become quite popular in recent times. The government has recently shown considerable interest in Solar technology with the launch of Quaid-e-Azam Solar Park in Bahawalpur. Previously, the Gillani government had also taken some steps to promote Alternate Energies in the country, such as starting Wind Energy projects in Jhimpir. It is hoped that better sense would prevail and the government would revisit the Fiance Act 2014 which has created this mess! Note: Since this article was published on July 29, 2014 there has been another article that totally refutes the imposition of any additional taxes on solar equipment. According to this article titled Demystifying the Tax on Solar Panels "if an importer verified the import (through the Engineering Development Board) as a unique product not manufactured or available in Pakistan, the importer would not have to pay custom tax". The news item about imposition of tax may have been untrue but it did have some effect as the 60-70 containers stuck at Karachi were immediately released. Posted in In The News. Tagged Alternate Energy, Indigenous Development, Solar, Solar Pakistan, Solar Panel. "The Fraunhofer Institute for Solar Energy Systems ISE, Soitec, CEA-Leti and the Helmholtz Center Berlin have jointly announced that they have achieved a new world record for the conversion of sunlight into electricity using a new solar cell structure with four solar subcells. Surpassing competition after only over three years of research, and entering the roadmap at world class level, a new record efficiency of 44.7% was measured at a concentration of 297 suns. This indicates that 44.7% of the solar spectrum's energy, from ultraviolet through to the infrared, is converted into electrical energy. This is a major step towards reducing further the costs of solar electricity and continues to pave the way to the 50% efficiency roadmap". "These solar cells are used in concentrator photovoltaics (CPV), a technology which achieves more than twice the efficiency of conventional PV power plants in sun-rich locations. The terrestrial use of so-called III-V multi-junction solar cells, which originally came from space technology, has prevailed to realize highest efficiencies for the conversion of sunlight to electricity. In this multi-junction solar cell, several cells made out of different III-V semiconductor materials are stacked on top of each other. The single subcells absorb different wavelength ranges of the solar spectrum". Let us now try to validate the numbers given above. Power is the product of voltage and current. This is the power produced by 5.20mm2 of solar cell. 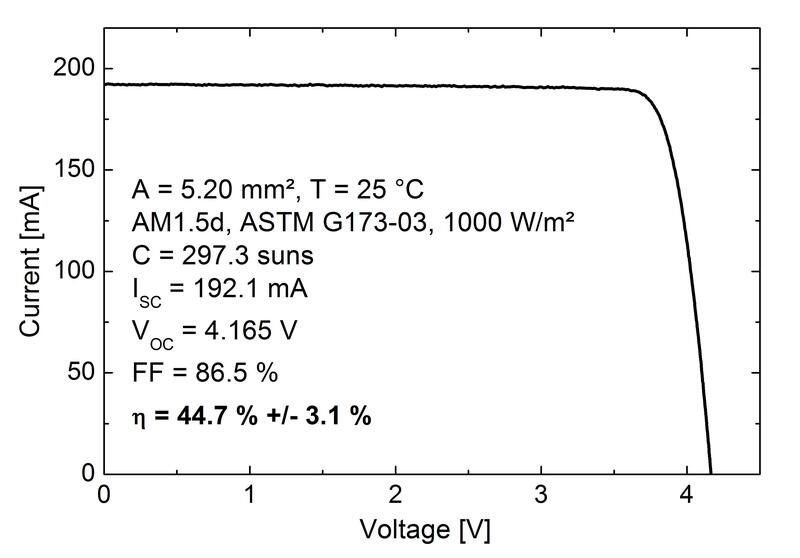 1mm2 of solar cell would produce 0.1331Watts. 1m2 of solar cell would produce 133.1kW of solar energy. This is the power generated due to 297.3 suns. A single sun would produce 133.1kW/297.3=447.67Watts of power. This gives us an efficiency of 447.67/1000=0.4477=44.77%. Posted in In The News. Tagged Band Gap, Efficiency, IV Curve, Solar Cell, Solar Panel. It is a common misconception that higher the temperature higher is the output of the solar cell. This is not true as the efficiency of a solar cell decreases with increase in temperature and lower efficiency results in lower output power. So in fact a bright sunny day, with sun rays perpendicular to the solar panel and a cool weather is the ideal combination for higher performance of a solar panel. Let us now look at this in a bit more detail. There are two basic reasons for decrease in efficiency due to increase in temperature. One is the decrease in the band gap energy (Eg) and the other is the decrease in open circuit voltage (Voc) with increase in temperature. The relationship between band gap energy and and temperature is quite straightforward and is given as. One might argue that the decrease in band gap would allow for more carriers to be transferred to the conduction band and yield a higher output power. However this is not true as the output power is the product of current and voltage and a lower voltage would reduce the power. In fact there is an ideal range of band gap which produces the maximum energy. Going too high or too low would not yield the optimum results. Next we turn out attention to the open circuit voltage Voc. The relationship between temperature and open circuit voltage is not that straightforward. At first it might seem the open circuit voltage increases with increase in temperature as shown in the expression below. But in reality this is not the case. Increase in temperature results in increase in intrinsic carrier concentration ni which in turn results in higher reverse bias saturation current Js. There is a squared relationship here so increase in intrinsic carrier concentration would cause a very large increase in reverse bias saturation current. And as is evident from the above formula this causes a decrease in open circuit voltage. This is also shown in the figure below. So to conclude a bright sunny morning in winter might not be the worst time to produce some solar energy (provided you have got your solar panel tilt right 🙂 ). Posted in Solar Basics. Tagged Band Gap, Efficiency, Open Circuit Voltage, Solar Cell, Solar Panel, Temperature.